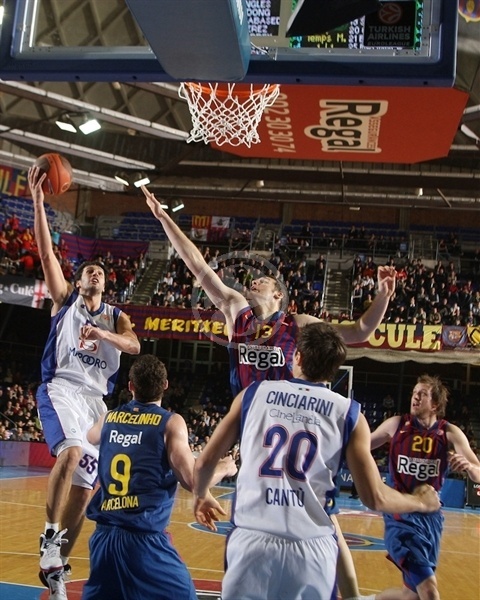 FC Barcelona Regal registered its first win in Top 16 Group H by edging Bennet Cantu 65-60 at home on Thursday. Barcelona and Maccabi tie for first place in Group H, with Zalgiris and Cantu right behind them. Chuck Eidson led the winners with 15 points. 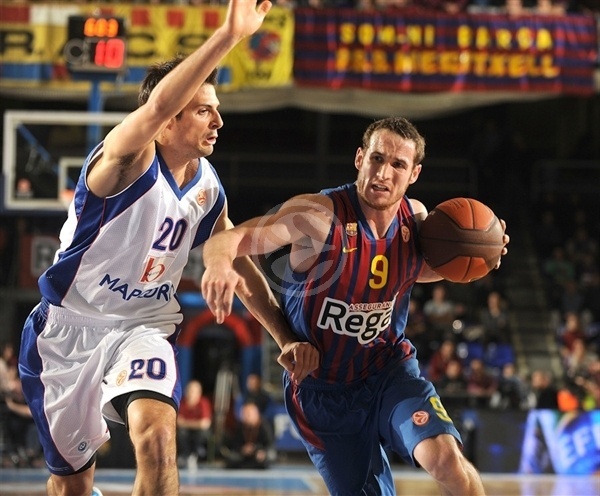 Erazem Lorbek added 13 and 9 rebounds, Marcelinho Huertas had 11 while Joe Ingles got 10 for Barcelona. Vladimir Micov and Gianluca Basile led Cantu with 13 points apiece. Basile, who played for Barcelona for six consecutive seasons from 2005 to 2011, was honored in a pre-game ceremony and fans sang his name before, during and after the game. Cantu led 15-18 after 10 minutes and kept a 28-30 edge at halftime. A jumper by Manuchar Markoishvili gave Cantu its last lead, 50-51, early in the fourth quarter. Barcelona improved its defense and found a go-to guy in Kosta Perovic, who lead a game-breaking 9-0 run that sealed the outcome. Lorbek and Eidson shined in crunch time to make Barcelona seal a tough win down the stretch. Cantu meant business at the start of the game. Strong defense kept FC Barcelona Regal scoreless for almost four minutes, and during that time big man, and former Barca player, Denis Marconato stepped up for six straight points to make it 0-8. Pete Mickeal sounded the wake-up call for thehosts with four points of his own but another former hero in Barcelona, Basile, blasted a three for the 4-11. When Barcelona settled down and Marcelinho Huertas blasted a bomb from the arc, the hosts came back to life dedspite Giorgi Shermadini's three-point play. A timeout of the hosts followed by another Huertas three made it 12-14. Micov tried to keep Cantu at a safe distance but Huertas had the last word with a free throw for a 15-18 score at the end of the first quarter. The second quarter started with a 6-0 burst sparked by Ingles' four straight points, a party which Eidson soon joined for a 21-18 Barcelona lead that forced the Cantu timeout. It worked a treat because with Marconato back on court, the points came again for the guests. In fact, Marconato's bucket sparked a 0-8 run for Cantu that soon made it 21-26 that forced a new Barca timeout. However things didn't work the same as they had for the guests. at first, an Eidosn layup seemed to get Barcelona going, but strong defenses on both side didn't allow for many points and newcomer Greg Brunner and Basile punished Barca's rim a couple more times for the 23-30 entering the last minute of the half. The hosts made the most of that time with an Lorbek jumper and two Mickeal free throws to leave it 28-30 at the break. Marconato split free throws but Lorbek scored down low and Huertas took over with an off-balance acrobatic layup off a steal that gave Barcelona a 32-31 edge. Lorbek sank his trademark jump hook in the lane, as Cantu could not find the way to the basket until Basile stepped up with a three-pointer. Micov copied him from downtown to put Cantu back ahead, 34-37. Basile kept pacing the guests with a six-meter jumper that Mickeal erased in the other end. Micov hit a floating jumper but a corner three-pointer by Lorbek kept Barcelona within 39-41. Leunen fired in one from downtown but back-to-back layups by Eidson got the hosts even closer, 43-44. Huertas scored off a steal to make Cantu call timeout at 45-44. Micov stayed unstoppable with a six-meter shot and a free throw by Nicolas Mazzarino gave Cantu a 45-47 edge. Ingles nailed a corner triple and split free throws but an easy baset by Shermadini tied it, 49-49, after 30 minutes. Perovic split free throws early in the fourth quarter but he didn't find much help around. Meanwhile, a fallaway jumper by Markoishvili allowed Cantu to regain the lead, 50-51. 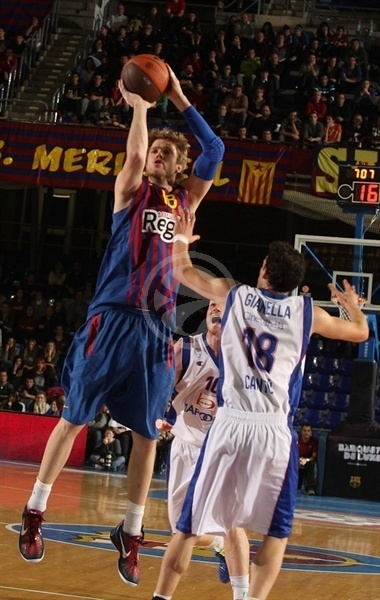 Barcelona missed its five opening shots in this period but free throws by Eidson restored a 52-51 Barcelona edge. The hosts improved their defense right when it mattered and a three-pointer by Eidson forced Cantu to call timeout at 55-51. 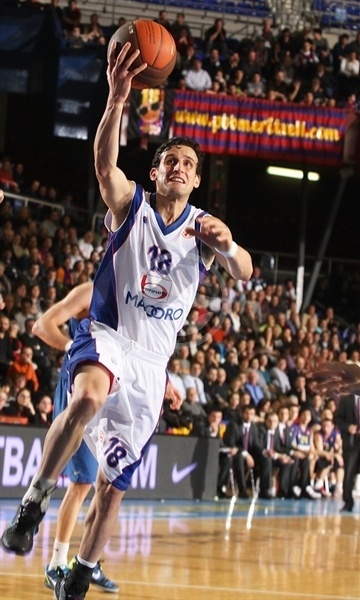 Perovic sank free throws, as Cantu kept struggling to score against Barcelona's intense defense. 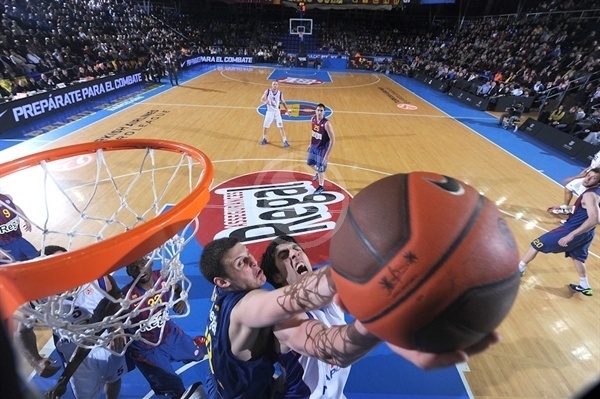 Perovic kept pacing Barcelona with a tip-in that broke the game open, 59-51, with over 3 minutes to go. Micov tried to change things with a big basket but a turnaround jumper by Lorbek kept Barcelona way ahead, 61-53. Andres Cinciarini made free throws and Basile buried another three-pointer but Lorbek and a wild dunk by Eidson allowed Barcelona to stay in the driver's seat until the final buzzer. "We came back due to our hard work. We did not shoot well, especially in the first half. In the end we got the win and moved up to 1-0. It is very important to win and be solid at home. 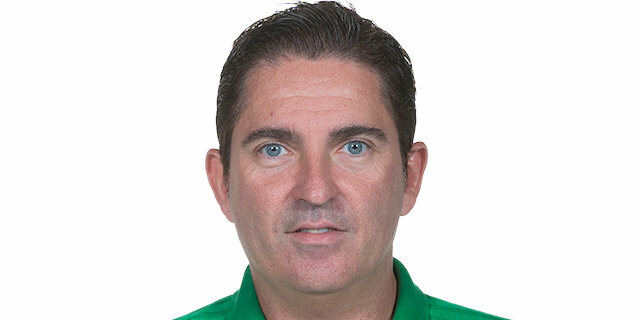 We consider it a good result against a team that is always there and punishes you for every mistake. It is always difficult to win the first Top 16 game at home. That was shown in the beginning of the game, in which we were a bit nervous and things got more complicated. We won all the quarters but the first one and needed to go point by point in order to come back." 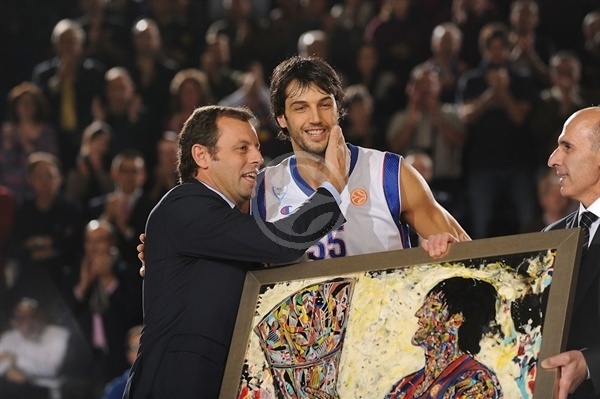 "It's hard for me to give an opinion about Basile on how he has played 210 Euroleague games. I think for us that Gianluca is a person first and then a very important player. We played a good game. Honestly, I thought it might be worse because of the show that was here before the game that sometimes affects the performance. 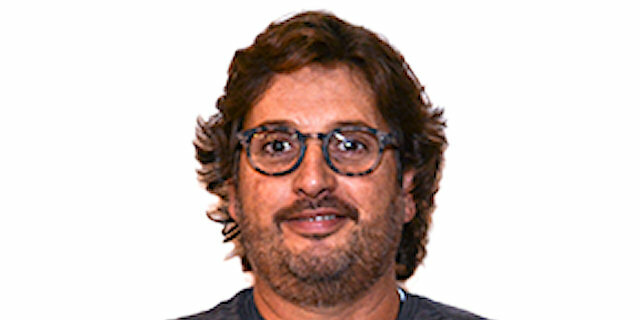 I'm happy, Basile has been playing so many minutes."